I finished this one in 2008 and really enjoyed it, so am definitely doing it again. 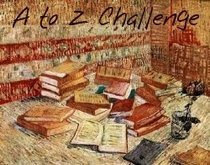 There are many options this year (check out the challenge post), but I'll be sticking to the same formula as in 2008, so by title AND by author. The only difference from last year is that I'm not making a list, simply slotting in whatever I read for the other ten thousand challenges I signed up for!